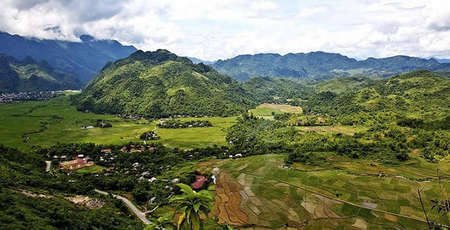 Located in Hoa Binh province, approximately 135 km from Hanoi, Mai Chau is not only well known for its majestic and authentic beauty but gives endless inspiration for poets by its unique and flavorful taste of local food. The culinary of Mai Chau is a perfect combination between different cultures of ethnic group, such as Thai, Muong, Nung, Tay, La Ha and Muong. In each new land, when you start picking your luggage up, you cannot know exactly what is waiting for you and Mai Chau’s local food is not an exception. 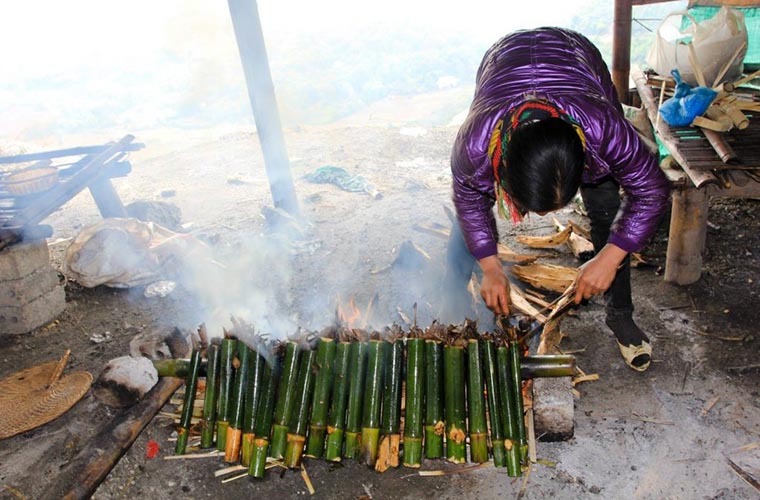 Since Mai Chau is the hometown of various types of fragment rice, it has also the place of “Cơm lam” or so called the Steamed sticky rice in bamboo tubes. 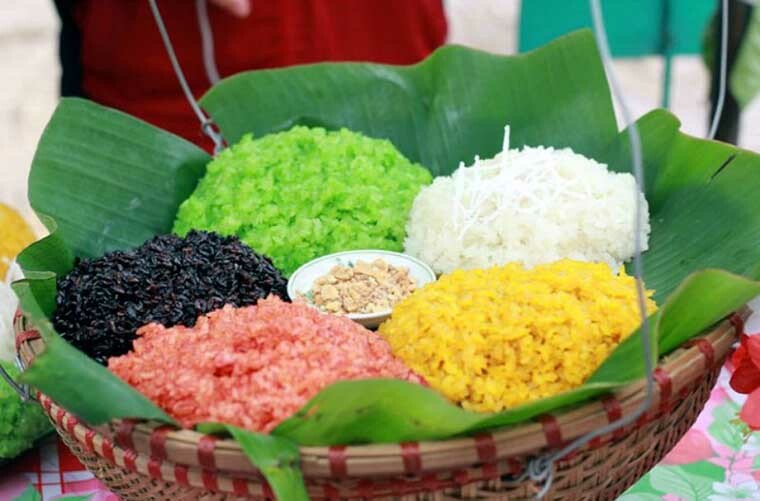 This special rice is made from glutinous rice which is grown right on Mai Chau highland. Before being steamed, the glutinous or sticky rice have to be soaked overnight or at least 4 hours so as to be soften. After that, to add in the flavor, local people usually mix the rice with a little bit of salt and coconut milk. Then they use banana leaves to gently put the rice into the bamboo until the rice reach the bottom. The last step is burn it on fire for 25 minutes until it gives the pleasant savory. 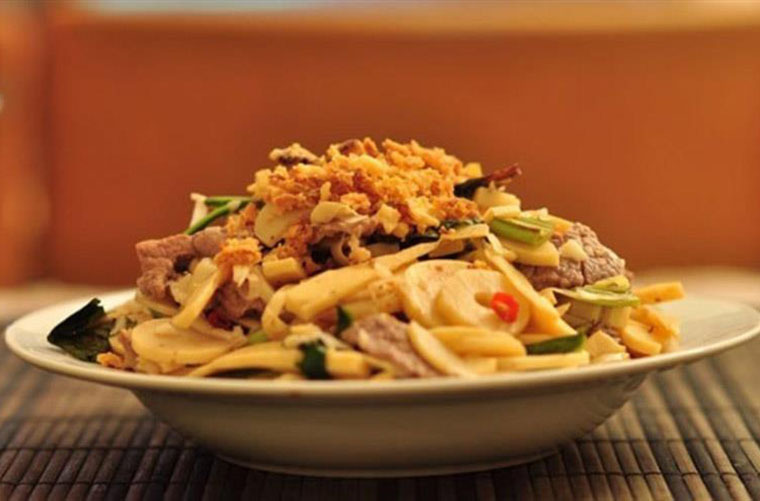 How to eat “Cơm lam”? When it is well cooked, you should remove the singed skin of Bamboo, leaving a thin cover and et. Well-cooked bamboo rice has a special flavor of soft roasted rice as well as experiencing the sweet flavor of rice and coconut, and the greasy saltiness of sesame or the unique taste of grilled wild boar are certain to induce diners to fall in love with this dish. 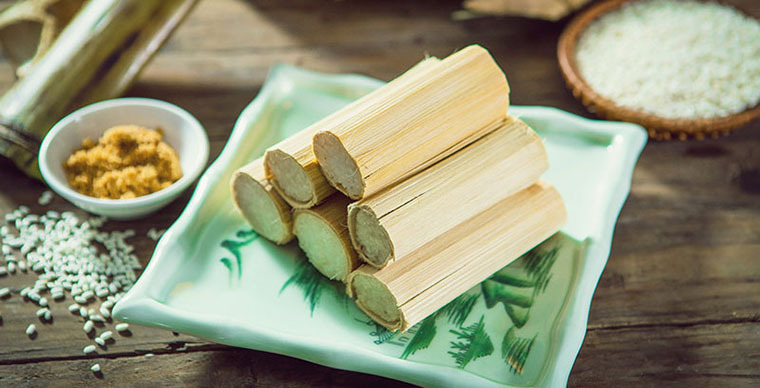 The softness and freshness of the roasted rice in fragrant bamboo can be preserved within 10 hours, and taste good weather hot or cold, thus you do not hesitate to bring them home as a gift for your friends and family. Grilled pork, which is made from an unique type of pig raising in this highland, can be known as an unmissable experience for every tourists. 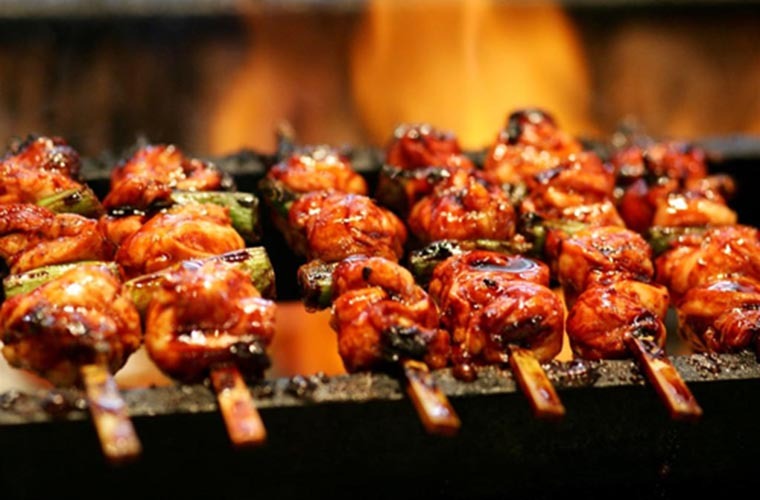 After being burn in fire, the grilled meat is carefully sliced into small pieces and mixed with various types of spices such as salt, chili powder, lemon grass, ginger, vinegar. 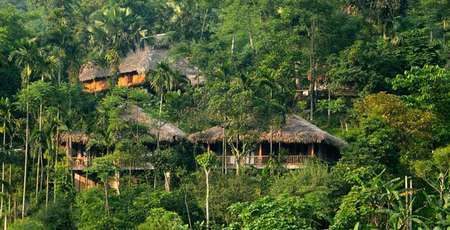 Jungle bee and baby bamboo, bringing along with the breath of mountainous areas, are those special gifts that mother of nature endowed this land. Every summer day, when the local finds many beehive, taking home and turning them into delicious dishes. Mature brown bees are usually used to make bee wine; the fat and rich larvae are used to cook with bamboo. Firstly, they are washed and cleaned with cold water the fired until turning to a greasy yellow color. At the same time, the bamboo shoots are stir-fired until they are thoroughly cooked and the larvae are added. This bizarre dish is not only tasty but it is also extremely nutritious as the larvae contains lots of vitamins, proteins, minerals, sugar and amino acids. There is no doubt that people might be slightly intimidated by looking of that creepy bud on the plate. However, it is so truth that Asian eats everything that move and so do you. Just one bite and you will fall in love with the crunchy taste of fried bee, the spicy and sour taste of baby bamboo. Known as a daily food of Thai people, those living in Mai Chau, “Xôi nếp nương” is famous for its wonderful texture and taste. Grown and harvested right on the paddy fields on the mountain side in Mai Chau, the rice is cooked in a wooden cylindrical steamer, bringing along the very unique flavor. One of the most interesting thing about sticky rice is that the rice is cooked by the steam more than one time. After being cooked for the first time, the rice is taken out into a basket to be carefully stirred and the re-cooked for the second time. This way of cooking allow the rice’s flavor fully bloom. 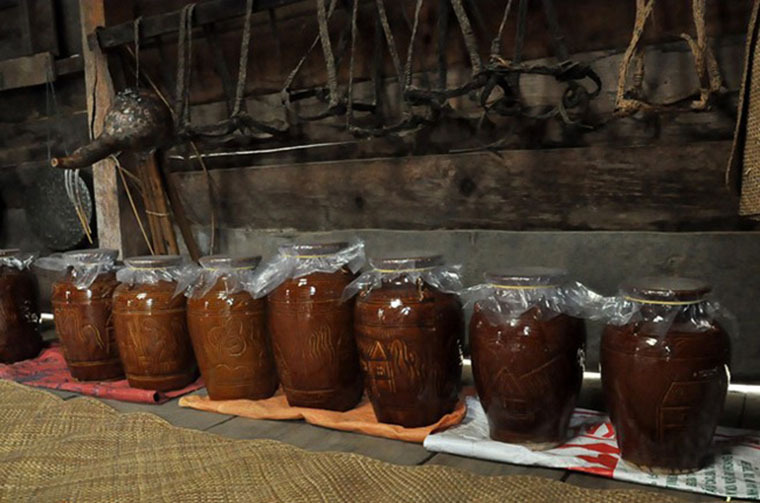 Those who ever visit Mai and have a chance to taste Mai Ha wine, the traditional art of skillful white Thai people shall never forget that special taste. Opening the bottle, you can smell the flavor vanish through the air. To produce a high quality bottle of wine, Mai Ha wine takes much skill and experience throughout a sophisticated process. It is the yeast from the leaves of a specific type of local tree that is one of the most important element to generate special taste of Mai Ha wine. 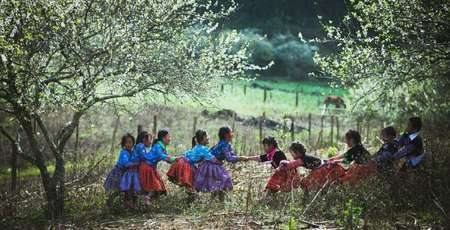 Beside, making good wine requires the combination of at least 9 different types of forest leaves, ginger and galangal, which are all grounded and dried before being mixed with rice flour and tapioca. Thai people usually drink Mai Ha wine in some typical events like Tet holiday, ancestral worship ceremonies.